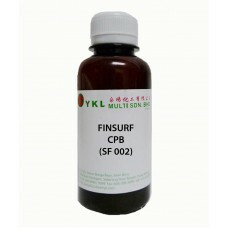 FINSURF CPB is an amphoteric surfactant which provides excellent foaming and viscosity building with anionic systems. It is often used to boost and stabilize foam in shampoo and body wash formulations. FINSURF CPB is supplied in light yellow clear liquid with 35% dry solid. It is compatible with anionic, cationic and nonionic surfactants. Recommend to add into cold or warm formulation after primary and secondary surfactants.